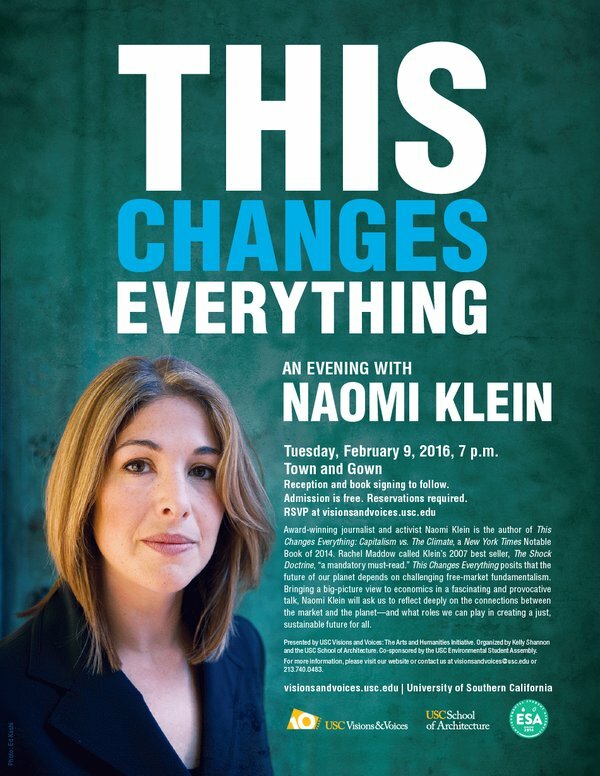 Just hours before 900 NUHW members at the University of Southern California’s Keck Hospital went on strike, they got a huge boost: author and activist Naomi Klein, a guest speaker at USC’s Bovard Auditorium on February 9, took a few minutes at the lectern to voice her support for Keck caregivers fighting for better patient care as well as fair pay and benefits for caregivers and their families. 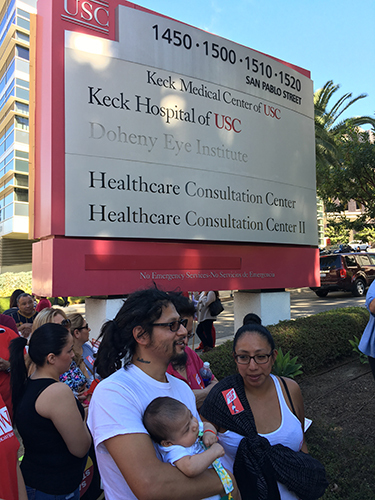 “Nine hundred USC workers at Keck Medical Center will be walking out on a 24-hour strike tomorrow,” Klein said to a round of applause. “They’re here tonight. They’ve got fliers, I’m going to have some of them at my signing table. I really urge you to learn about this. 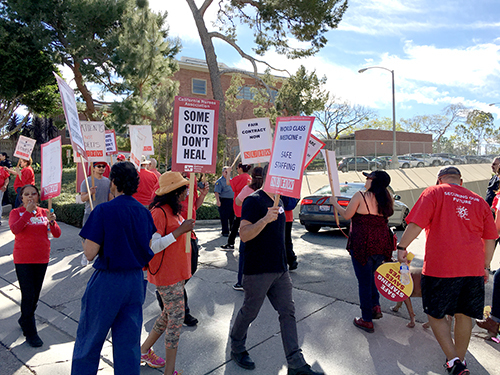 … We need to support them as they resist cuts to staffing levels and resist poverty-level wages, with many people earning less than $15 an hour. … At a school as well endowed as this one, all workers should be paid a living wage. 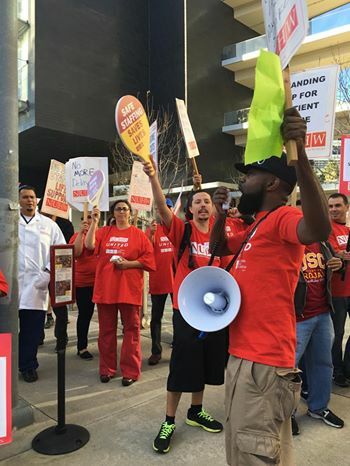 [Applause] Making sure that hospitals are clean and that patients are well-fed is not menial work, it is some of the most important work in our society and we need to act like this.” See the video below. 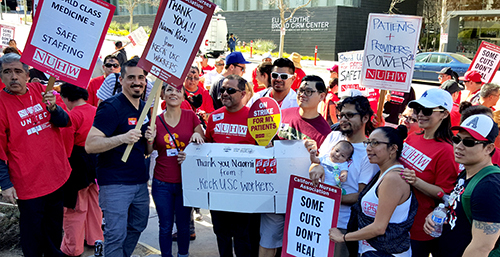 At 6 a.m. the next day, the picket line grew rapidly and media soon arrived: Telemundo KVEA 52, KCBS-TV Channel 4, KTLA Channel 5, USC Annenberg TV and Radio, and the Los Angeles Times. 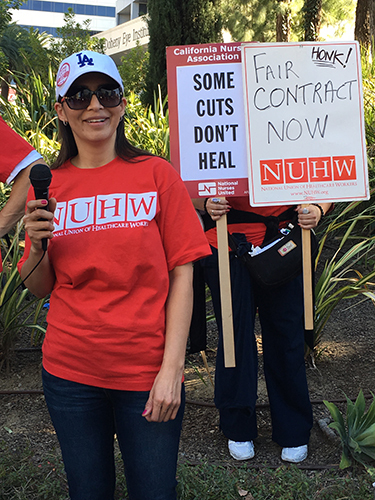 KNX Radio interviewed NUHW President Sal Rosselli. 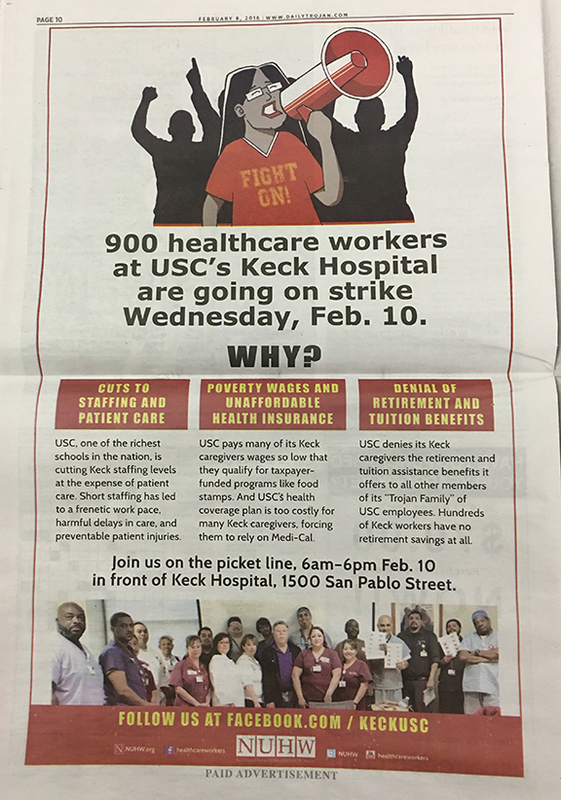 Other media that covered the strike include Southern California Public Radio KPCC, KCRW radio, MyNewsLA.com, Westside Today, Patch.com, and USC’s Daily Trojan published stories on Feb. 1, Feb. 8, and Feb. 11, and ran a full-page ad on Feb. 7. 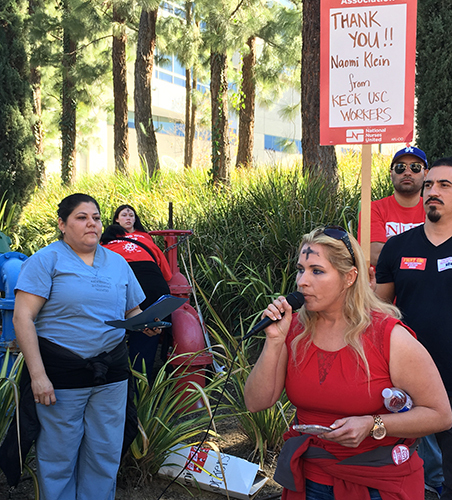 At the noon rally, Keck workers stepped to the microphone to describe the issues they confront at the hospital and to thank Naomi Klein, Keck nurses represented by the California Nurses Association, Unite Here Local 11, and Teamsters Joint Council 42 for their support. 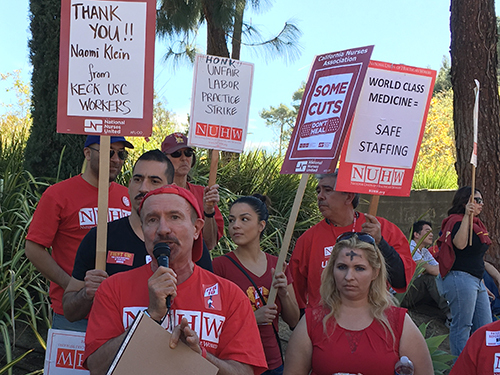 Other speakers included representatives from USC student organizations and faculty, other USC workers represented by CNA and UNITE HERE, a representative from Los Angeles City Councilmember José Huizar’s office, and NUHW President Sal Rosselli. 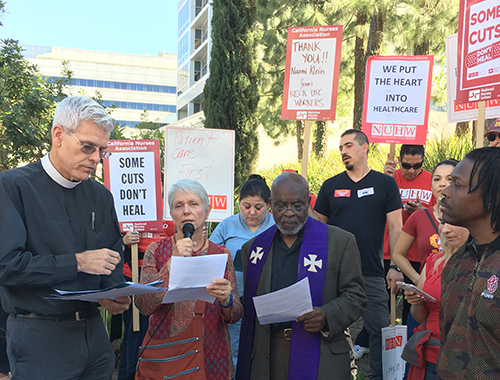 The rally also included an interfaith blessing ceremony performed by local clergy. 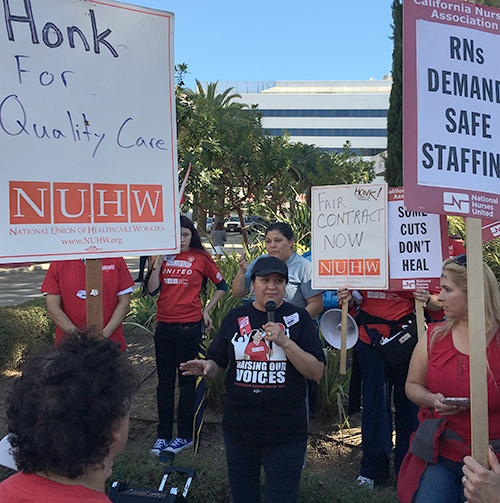 “We showed Keck–USC that we’re standing strong and we will continue to fight against their staffing cuts, their poverty wages, and their inadequate benefits,” said NUHW member Judy Oliva. 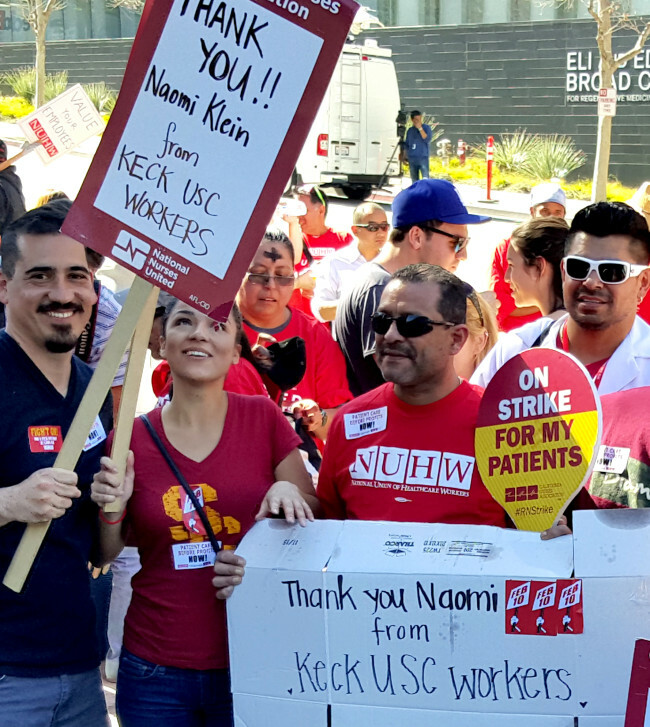 For more information on the Keck–USC strike, click here to read NUHW’s press release.